Culture is all about heritage , tradition as well as the rich artifacts. Master potter Lee Eun-koo is spreading Korean traditional pottery from his studio in Icheon, Gyeonggi Province. Home to the nation’s foremost ceramic artisans, the city is known for its theme parks and festivals dedicated to preserving pottery tradition. ICHEON, Gyeonggi Province ― Traditional pottery may have little relevance in modern Korea, but it's still a preferred choice for a special gifting occasion, like when PGA Tour golfer Yang Yong-eun greeted some star participants ahead of the 2011 Kolon Korea Open. The 2009 PGA Championship winner chose traditional ceramic vases as gifts for two athletes, the 2011 U.S. Open champion Rory McIlroy and Rickie Fowler of the U.S. The handmade crafts were by Lee Eun-koo, one of handful of first-generation Korean potters who still work with firewood kilns at his studio in this small town just over an hour southeast of Seoul. Former presidents Kim Young-sam, Kim Dae-jung and Roh Moo-hyun had also chosen Lee’s works as gifts to their counterparts from Japan, China, U.S. Canada and Russia among other countries. One of the most respected potters of his time, Lee has held many exhibitions here and abroad since his first U.S. exhibition in 1981. He held a series of exhibitions in Japan at the invitation of the Japanese government to commemorate the 2002 Korea-Japan FIFA World Cup. The 69-year-old artist specializes in "buncheong" ware, a form of traditional pottery marked by decorative designs and elaborate carvings. The style emerged in the early Joseon Kingdom (1392-1910), replacing celadon that had been in common use. Buncheong largely disappeared from Korea after the 16th century due to the popularity of white porcelains. In modern times, the buncheong style has been revived here by Lee and his generation of potters after the Korean War (1950-1953). "Celadon, or cheongja, and white porcelain, baekja, came from ancient Chinese dynasties. But buncheong is form that originated from Korea," Lee said in a recent interview with The Korea Times. "It started in Korea and then was transferred to Japan." 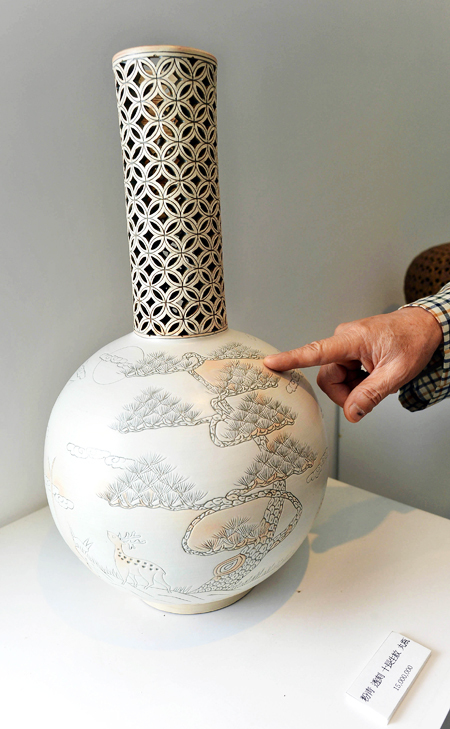 Born in 1943, Lee majored in architecture at Hanyang University in Seoul, but he took up traditional pottery in 1962. 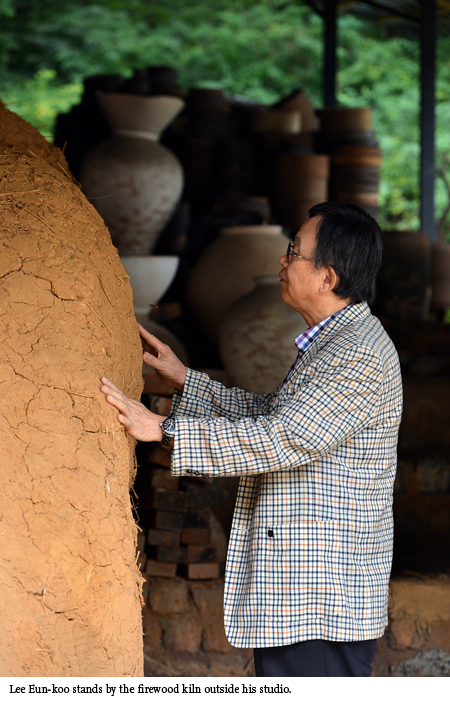 He founded his studio "Cheong Pa Yo," meaning a kiln nestled in the green hills, in 1976. 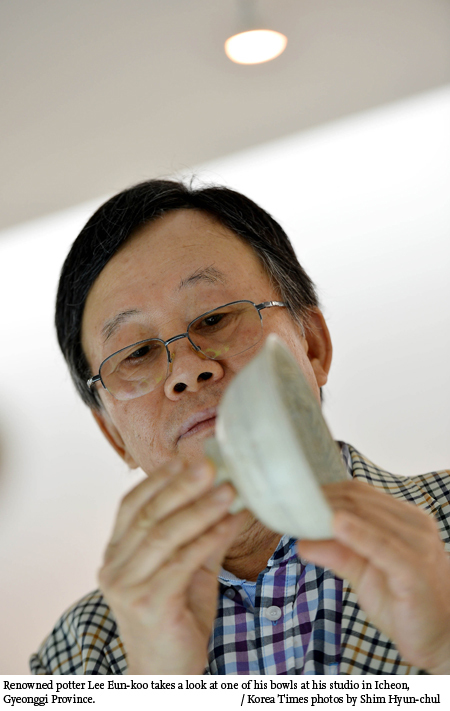 He is one of the renowned potters based in Icheon, Korea's center of pottery. 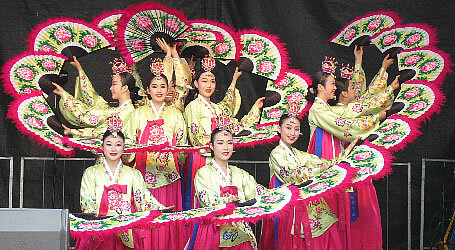 This small city with a population of around 200,000 is one of the key artistic hubs of Korea. 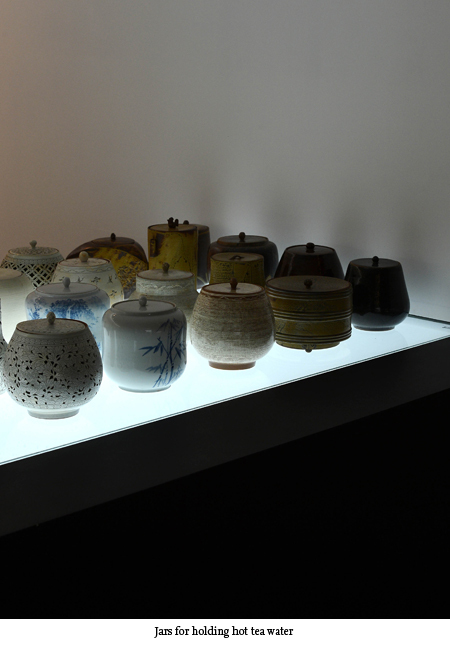 It has been a center for Korea's ceramics craft for since ancient times. After the Korean War (1950-1953), artists and potters gathered here to take advantage of the area's abundant expertise and raw materials. "This city has traditionally had skilled potters and since the 1960s, the ceramics industry began to flourish," Lee said. The city's ceramic-related activity is concentrated in the Icheon Ceramics Village. The village is home to around 80 ceramics production facilities and shops, with an estimated 300 active kilns, some of which are of the traditional wood-burning style. Next to Lee’s office is a small exhibition hall of his most prized works. The firewood kiln, situated outside the studio, was not being used on the day of the interview. "We usually work intensively in the fall and spring seasons. In the summer, it is hard to work by the fire," Lee said. To complete one piece, it takes from 15 to 30 days. 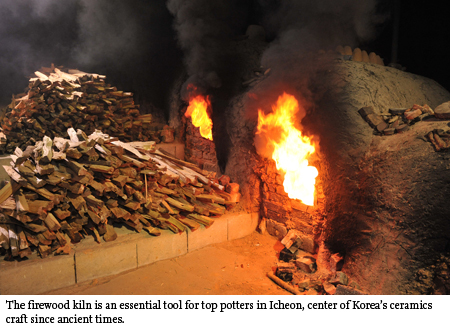 Central to the artist’s success has been the used of the firewood kilns, a method that dates back to the Joseon Kingdom. Modern kilns are either electric or gas-fired electric kilns. Over the years, his works have been exhibited in many overseas countries. It is in Japan that Lee's works have particularly been well-received. Lee plans to hold more overseas exhibitions in China and Japan early next year. "Japanese people are fond of Korean pottery. 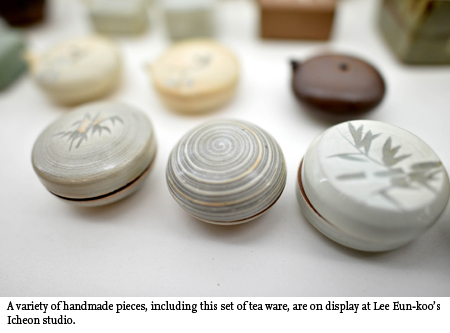 There is a Korean influence in Japan's tea-drinking culture, like some of their tea ware that originally came from Korea," Lee said. The Icheon Ceramics Festival, which features cultural performances and hands-on pottery-making opportunities, takes place every spring, but there are activities all-year-round for tourists. Icheon also has many stores where visitors can purchase ceramic items. The vases and other objets d’art produced by the village’s top artists ― some of who are designated national treasures ― are very pricy. But many household and decorative items, including tableware, tea sets, mugs are useful and reasonably priced. 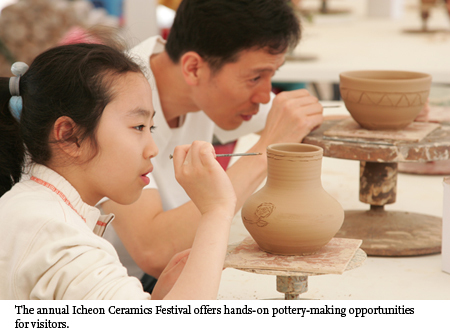 “Icheon sets itself apart from tourist centers such as Insa-dong, Seoul, in that we provide opportunities for visitors to see and experience for themselves how pottery is made," according to Lee.